Smoant Charon Mini Mod, which is powered by dual 18650 batteries to fire up to 225W, adopts 2-inch TFT screen to show status of vape clearly and advanced ANT225 chip with 0.015s heating speed to save your time. 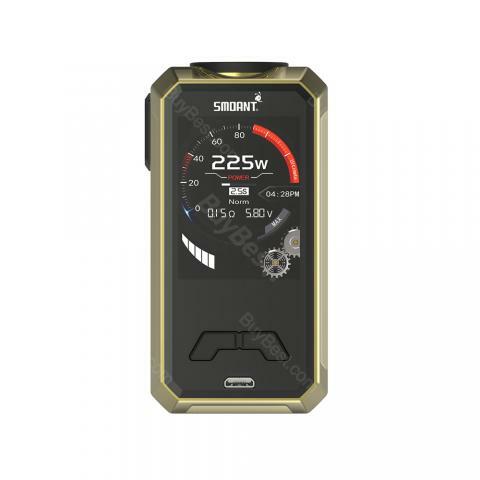 Smoant Charon Mini Mod, which is powered by dual 18650 batteries to fire up to 225W, adopts 2-inch TFT screen to show status of vape clearly and advanced ANT225 chip with 0.015s heating speed to save your time. In addition, it has VW and TC two curve modes to offer different vaping experience. What's more, it comes with various protections that include low voltage protection, reverse protection, over current protection, over heating protection and over time protection to ensure high performance. Ergonomic design will give you comfortable handling. Just get it to enjoy the perfect vaping. • Three-month warranty for Smoant Charon Mini Mod. Pro: Really good Mod with absolut great Temperature Control. Con: Battery Door a bit to loose. Very beautiful and good quality! It works great and satisfies everything! Demanding packaging and product! Thanks perfect! This device is a small, but powerful box mod. It also has a ton of customization options, and a beautiful 2.0” screen.